Explore northern Italy from the air with tandem paragliding flights near Turin. Location is situated an hour outside the city of Turin, Montaldo Dora, in Canavese area. 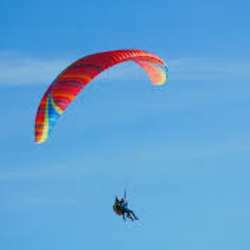 The tandem flight consists of a 1,500-meter take-off with a two-seater paraglider, born for educational purposes for a possible continuation in the paragliding discipline. It is piloted by an instructor to whom you will be firmly harnessed, and you can enjoy the thrill of a flight. Without special preparations and without the need for any medical examination, after a briefing take-off and flight that will last a few minutes you will be ready to take off and you will enter a fascinating world with your instructor and the air. After a few steps take off you will be in the air at a speed of 40 km / h for the next twenty minutes of flight in a unique atmosphere and you will enjoy unrepeatable emotions and, if you want, you can pilot until just before landing that your instructor will perform in total safety. 1.2 m / s the descent speed. Possibility if you want to run adrenaline manoeuvres in total safety. Your experience will be video footage in all its phases and lastly the landing. This formula includes take-off lifts with minibus, briefing, descent, video footage, assisted piloting, for a drop of Protected content about 20 minutes. The timing between the different flights is about an hour and a half. As they can bring 4 customers at the same time, we will be divided in 2 groups.